A small business dashboard is an all-in-one dashboard that helps you grow your small business by allowing you to track all your marketing channels' key performance indicators, spot trends, and gather business intelligence. In short, it's the right tool for sales and marketing project management and reporting. You're probably running marketing campaigns on a number of platforms. You should not only track and analyse data from each individual channel, but also combine and correlate results from these platforms together. Wondering what the right solution is to keep on top of all of this? Look no further - a small business dashboard is a powerful tool that lets you do just that. Take a look at what a small business dashboard entails! 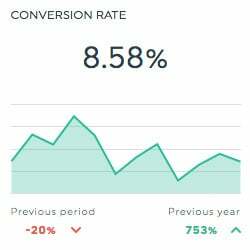 A small business dashboard is a powerful reporting tool that allows you to track and report on everything from Mailchimp email marketing campaigns to SEO to social media. As a small business owner, you'll want to optimize your marketing efforts to drive sales. A small business dashboard gives you all the data you'll need in one place. Why use a small business dashboard? By using a dashboard with all your important metrics and relevant business data in one spot, you'll easily be able to see where your marketing efforts are going well and what might need some tweaks. Using a universal dashboard will also save you time - we automatically fetch data so you won't have to pull data from each individual platform. What are the benefits of using a small business dashboard? Besides being able to track data across all your marketing channels, a small business dashboard will let you spend more time running your business and less time creating marketing and sales reports to track your business performance. No more inputting figures into Excel! Create your own small business dashboard today! What are the best marketing dashboard KPIs? Google analytics, social media, Google AdWords, email marketing, lead generation... you have many different marketing activities across several channels. The perfect analytics dashboard is going to include the key performance indicators that provide you and your client with just enough information to understand the big picture of their marketing performance, without overwhelming them with details. What are the top small business dashboard metrics? Try to steer away from 'vanity metrics' on your small business dashboard. The metrics you track using your dashboard should be ones that give you an insight into customer behaviour and tell you how your marketing efforts are driving sales. This metric tells you how many people found your website via search results and then took a desired action on your website. This metric tells you the total number of times a person has clicked on one of your paid Google Ads. 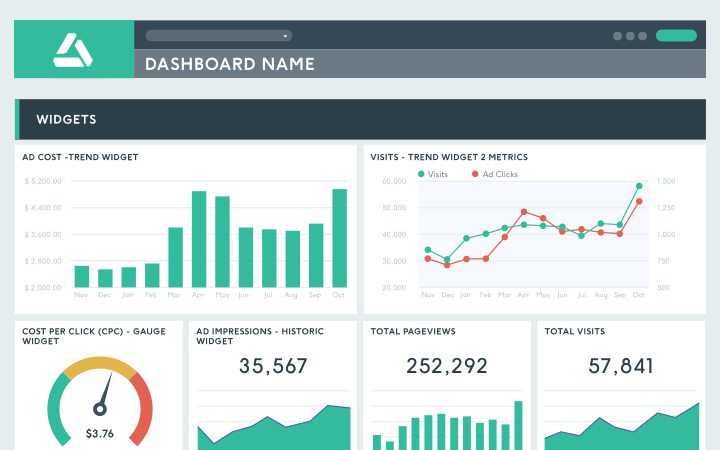 See all these KPIs and metrics in your very own small business dashboard! What platforms should a small business dashboard include? A small business dashboard should include data from every channel you use for your marketing strategies. Comparing your data will let you better understand how your channels play off each other and help you reach your business goals. If you need to import custom data, (from Salesforce or Zoho, for example) just upload a CSV file. DashThis' small business dashboard sample gets your sales and marketing team off to a running start. It includes on-demand reporting, preset KPIs, multiple available data sources, and easy-to-use features and beautiful visual analytics. Best of all, all your important data will be in one spot - just drag-and-drop the widgets you need. Whether you choose from among our preselected small business dashboard templates, or create your own from scratch; it's all a matter of dragging-and-dropping the KPIs you want! Get a business dashboard with a custom, white label design that reflects your brand's colours, fonts, and overall vibe. Save on a custom URL and design with a white label bundle that includes both! Your business dashboard just the way you want! DashThis has dashboards for every marketing channel, depending on the type of data you want to track. Social media is an essential digital marketing platform. Keep on top of your Facebook ads with our Facebook Ads dashboard. If you specialize in the ecommerce space, and you need to track KPIs like transactions, revenue, product sales, and conversion rate by channel, then this dashboard is for you! Organic traffic is a key source of traffic for your business. 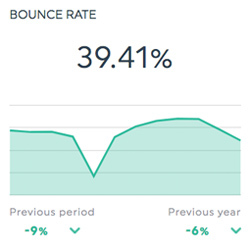 Make sure your website stays optimized and track web analytics using our intuitive SEO dashboard. Managing a business without measuring, reporting, and analyzing is like flying blind! Get tricks of the trade from our team to create the best dashboards to help you make better business decisions!